God who is able to turn evil into good was also able to make use of Jonah's disobedience. If it was through Jonah's obedience that the people of Nineveh were to be saved, it was through his disobedience that the mariners would be saved. When Jonah disobeyed the Lord he went down into a ship where there was people belonging to the Lord, whom the Lord loved and sought to save. The were gentiles like the people of Nineveh, and war likewise in need of salvation. Let their salvation be through Jonah's disobedience. Jonah was an instrument in the hand of the Lord by which He conquered, with its obedience and with its disobedience. It was as though the Lord said to Jonah: "Do you think Jonah, that you have fled from Me?! NO, you have not. I will send you to the mariners, not as a prophet nor as a preacher, nor as a voice crying out calling people to repentance, but as a guilty person and a sinner, and a cause of a dilemma and trouble for others, thus I will save them through you." " In this way you will be a blessing when I send you and a blessing when you flee. You will be a blessing to the people of Nineveh when they dread you as a prophet, and a blessing to the mariners when you are cast out into the sea as a guilty person. I will carry out My purpose through you in whatever state. Even when you are in the belly of the whale, not among the Ninevits nor the mariners, but when you are on your own in the belly of the whale, I will make you a prototype of My death and resurrection so that in mentioning your story people will learn. 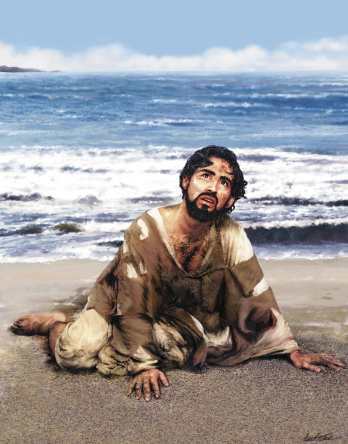 "Did you sail in the sea when you were fleeing from Me, O Jonah? Then you entered also in the domain of My will, because I own the sea as I own the earth; both are the work of My hand. Anything that comes into the hands of God will surely yield something good. God saves by all possible means people, and as the apostle said: "all things work together for good to those who love God,"
We also notice in the Book of Jonah that, in the same way God use Jonah's rebellious attitude and disobedience in performing His will, He also used irrational creatures who were more obedient than the prophet.